Had the June 2009 survey passed, it would have meant serious momentum toward a long-term goal of the Honduran social movement, the writing of a new constitution by way a people’s assembly, inviting representatives from every sector and municipality to join in the re-founding of Honduras. The coup, a joint operation by the military, supreme court, congress, and business elite, put a stop to all of this. It meant that the current Honduran constitution, written under a US-backed military dictatorship in the early 1980s, would continue to benefit a small elite. But the coup also gave rise to the creation of the National People’s Resistance Front, which now has local chapters in each of Honduras’ 298 municipalities. The resistance movement is dedicated to bringing about a new constitution, at whatever cost. Molina is the host, producer and founder of the radio show Resistencia. The show airs on the station Radio Globo, which has supported resistance and pro-democracy movements since the coup. 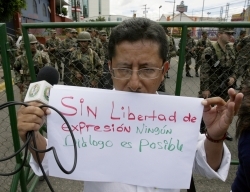 In the November 2009 Honduran general elections, Porfirio “Pepe” Lobo was elected president in a vote took place under what some considered a state of siege. In the five months between Zelaya’s kidnapping and the vote, more than 4,000 anti-coup activists were arbitrarily detained. Anti-coup media outlets were repeatedly shut down by the military. More than 100 community organizers were assassinated. Meanwhile, Zelaya, the president in exile, made his way back to Honduras and hid out in the Brazilian embassy in Tegucigalpa surrounded by the military. As a result of the deteriorating security conditions under the interim coup regime headed by Roberto Micheletti and the military’s offensive against the resistance, all international election observation bodies refused to send observers. Regardless, the United States and Canada applauded Lobo’s election, and put pressure on other countries to do the same. The Harper administration has shown it is especially eager to work with Honduran officials since the coup, and Canada’s corporate interests in the country continue to grow. In August 2011, Stephen Harper traveled to Honduras and signed a free trade agreement with Honduras. The announcement was unexpected, and took many by surprise. Honduran congress is considering a new mining law, which critics say prioritizes corporate interests over human rights. This mining law, they say, is designed to benefit mining companies by, among other things, failing to protect access to water and limiting both access to information about mining activities and the ability to have mines closed. Canadian mining company Goldcorp has faced criticism of its San Martin gold mine, which operated from 2000 to 2008 in central Honduras. Goldcorp consistently denied that its operations had anything to do with a variety of health problems among locals, including miscarriages and skin diseases, as well as the death of livestock. In 2011, results of tests conducted in 2007 were finally released, showing heavy metal poisoning among 62 residents of the area near the mine. The National People’s Resistance Front recently voted to form a political party as another way to confront these corporate interests. Some groups within the wider resistance movement believe there are other ways to continue the struggle, such as establishing autonomous popular zones and small-scale municipal powers. Stéfanie is part of the Montreal Media Co-op and is currently interning at CKUT 90.3FM’s community news department. Jesse Freeston is a media co-op sustainer and maker of the upcoming film Resistencia about the ongoing farmer occupation of Honduras’ Aguan Valley, www.resistenciathefilm.com. The three are charged over events that took place on 30 September 2009, when confrontations between demonstrators protesting against a new water law and the national police ended with the death of a Shuar Professor Bosco Wismua, who suffered a fatal blow to the head.